Deepesh Agarwal, 30, was working with Motorola India as an engineering manager, where he was instrumental in designing some unorthodox but useful applications of mobile technology. But then the entrepreneurship bug bit and he left his job to join the Indian School of Business (ISB), Hyderabad. He graduated this year, majoring in entrepreneurship. It started with a campus discussion in August last year on why shared transportation does not work in India despite the ever increasing traffic and pollution and scarcity of parking space. The idea of a shared cab service took off from there and Agarwal and his former partner, Amit Gupta, started working on a model they thought would work in India. “RideInSync has evolved over the past year and is drastically different from what my start-up partner Amit Gupta and I initially visualized it as," Agarwal says. They tweaked the model and soon after their graduation, ran a pilot service on 11 April for students of the incoming batch at ISB. The results were encouraging. “120 students used our service to share 60 cabs—saving Rs36,000 and 200 litres of petrol in a single day," Agarwal says. 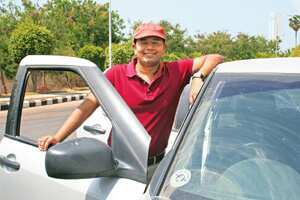 It encouraged him to turn full-time entrepreneur, though Gupta moved on and took up a job. Agarwal commercially launched RideInSync this month, after tying up with taxi drivers. It already has 173 registered users in Hyderabad, who can avail the service for travel between the airport and the city. In the first phase, Agarwal hopes to extend the service to Bangalore, Mumbai, Delhi and Pune. “So far, things have worked well for us and it is still too early to say if everything will go according to plan. (The) support provided by ISB’s Wadhwani Centre for Entrepreneurship Development has helped us cope with the initial difficulties in starting up one’s own venture but it is still a long road ahead," he says. “As an entrepreneur you wear multiple hats and have multiple responsibilities," says Agarwal. If the venture doesn’t succeed, the experience gained would be enough to get jobs. “Besides, I always have the option of trying out another idea." “If you do not begin, then your chances of success are zero. When you start somewhere and put in serious effort, your chances tend towards 1."